That's not a nifty background image. 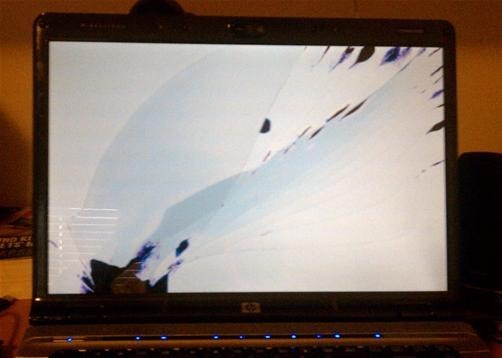 That's my laptop after it fell from the bed while playing a game of Starcraft 2. Broken screen. I wonder how much does it cost to repair. brb, taking it out on the wife. So yesterday we played two games together. Us two (Terran/Protoss) vs the AI(one on easy, one on medium, both random). We won the first one and lost the second one. Looking at the replays, all the AI does is build up units and harass others as soon as they can. They have no defenses. If you repel one of their rushes, that's the time to strike back if you have anything left. Replays of matches in the game are awesome. I mean, just really well done. You can fast forward, pause, and click on anything to get more information. You really do learn a lot by looking over a previous match. I don't remember if SC 1 had replays like this, but this is a very nice feature. Most people upload their matches to be watched by others, and many of the good ones end up on youtube complete with commentary. We really like the commentary in these videos. The way the commentator was making sexual advances towards the Mothership made us laugh. You could tell he was honestly exited about the match. Watching these types of matches can be addicting. I don't like watching many things, but these are fun. Looking around for SC videos lead you to other weird ones, like South Korean videos of their favorite players. They're fun to look at, especially televised matches. I'm on vacation so it's very hard to write anything but we did get a chance to play the new downloadable Lara Croft game. We loved it. It's sort of like a co-op Diablo with puzzles and good shooting mechanics. It's worth getting, at least from my initial impressions. PC and PS3 versions will be released 1 month from now, you can only get it from the 360.